Can galaxy beam upgrade to ICS? If mini projector come with Galaxy Note 10.1, even better. Wish Samsung would do a Galaxy Note 7 with full phone calling. 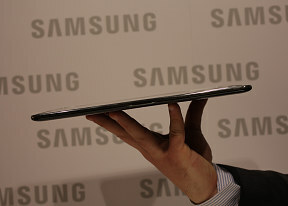 The Galaxy Note 10.1 look sooooo slow!! The Beam is just the shizzles! AnonD-24221, 27 Feb 2012how big is projection on the wall? it doesn't seem so big, not bigger then 10-15 inches...Up to 50 inches. samsung is waiting that let the brands fight in MWC and after that let them bring in the products in the market and samsung will then bring something high end in the market so that they can easily get the user attention because in MWC the users are getting overloaded with so much information. Do you seriously think that they will launch a flagship without even a keynote and a big media event?? Simple fact -- how many companies are fighting for front page coverage now? I saw HTC, Sony, LG, Nokia, Huawei and many more. Why would you think they would launch their flagships in such a crowded environment?? Let the rumble settle down, wait for 1-2 months and then reveal your products. What best then to wait for iPad3, then launch next-gen Tab line and showing how it's better than the iPad. When they are gunning for Apple, it makes no sense for their products to be in direct comparison with HTC/LG/Sony/Huawei etc., It won't give them that mileage in media they need to fight Apple. Wait for the proper Galaxy Tab (2nd Gen) in next 2/3 months along with GS3. Let's see what Moto has in store eh? Are they even at MWC? I wish samsung had something more high-end to offer.